Studies show that about 1 in 3 cancer patients experiences high levels of pain. Patients with more advanced or metastasized cancer are more likely to experience cancer pain, which is usually a result of the disease, or sometimes a result of cancer treatments. Medical tests such as biopsies or spinal taps, which help doctors in the diagnostic process, can be painful. Tumors that grow larger or spread to other parts of the body can press against bones or tissue, creating a very uncomfortable experience. Treatments like chemotherapy, radiation, or surgeries required to remove cancer-affected tissues or tumors also come with a level of pain and recovery time. These treatments may potentially damage nerves, which can cause sharp or shooting pain. The first step in managing your cancer pain is to be open and honest about it with your doctors. Your pain can be managed, but it may take some help from your end. Keeping a log of where your pain is located, how severe it is, how long it lasts, and what makes it better or worse can aid doctors in identifying what is causing your pain and how to treat it. Rating your pain on a scale of 0-10, with 0 being no pain and 10 being the worst pain, is also helpful to doctors. Over-the-counter medication, such as aspirin, ibuprofen (Advil, Motrin), or acetaminophen (Tylenol) often works to relieve pain associated with cancer. If over-the-counter drugs are not effective, your doctor could prescribe weak or strong opioids, such as oxycodone, hydromorphone, methadone, or fentanyl, based on your level of pain. These drugs usually come in the form of oral tablets, but may sometimes be used intravenously. Nerve blocks, which block pain impulses from making it to the brain, may also be injected into affected nerves. Another more permanent option for cancer pain patients is an implantable drug pump, which provides a continuous dosage of pain-relieving medication with lower rates of side effects such as nausea, when compared to oral medications. Non-medication related treatments like massage, acupuncture, or physical therapy may also be used to manage cancer pain. 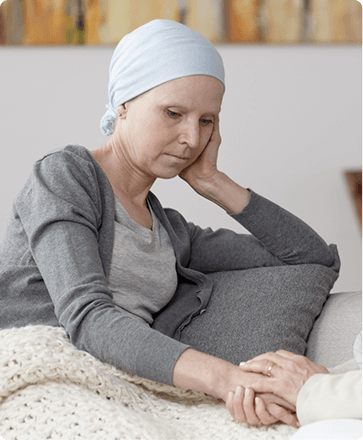 For more information on cancer pain treatment or to schedule a consultation with one of our pain management doctors, please call Chicagoland Pain Management in Bolingbrook, IL at (630) 312-4505 or in Hinsdale, IL at (630) 856-6825 or use our convenient online appointment request form.